✯ Apple Pay - Now available in Square for OpenCart. Out-of-the-box integration. No additional configuration required. ✯ Square Catalog & Inventory Sync - All changes in your OpenCart products automatically sync with the Square Items Library and Square inventory. ✯ Automatic Refund & Re-Stock - Square now lets you refund individual items in orders and re-stock items automatically. ✯ Automatic Currency Conversion - Automatically convert the transaction amount to the Square location currency based on your OpenCart currency values. ✯ Square Order Reports - Orders made with Square contain all your OpenCart information accurately reported in the Square Dashboard. ✯ Square Security - Win your customer's trust with the Square security badge displayed in the Credit Card form at checkout. ✯ Fast deposits - Get your money in your bank account in 1-2 business days. ✯ Dispute assistance - Square covers up to $250 in qualifying chargebacks per month and helps resolve chargebacks for you, so you can focus on your next sale. ✯ PCI compliance - Square complies with the PCI-DSS standards and there are no fees. ✯ Sell online and in person - Sell online and in person, and see all your sales in one place. Square’s beautiful readers accept all major cards, Apple Pay, and Android Pay, while the free Square Point of Sale app makes checkout a delightful experience for both you and your customers. ✯ Card Payments - is currently only available for merchants based in the U.S., Canada, Australia, Japan and the UK. 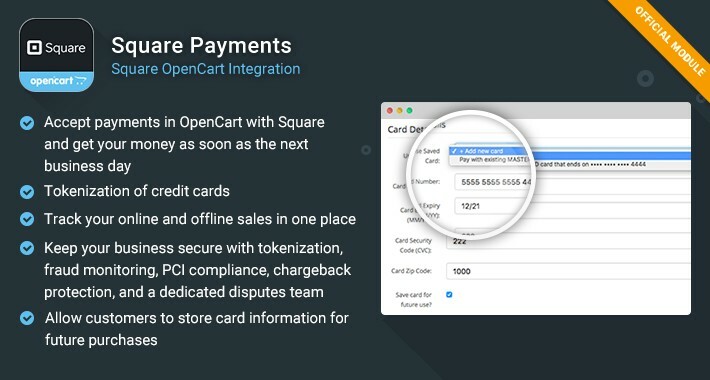 Square for OpenCart comes with extensive documentation with images, installation instructions, features explanations and examples. Works very well and Square provide an excellent multi channel payment service.